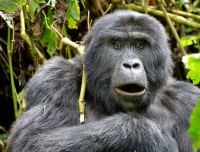 The most recently-created national park in Uganda, Bwindi Impenetrable National Park is one of the last remaining natural gorilla habitats in the world. Major conservation efforts have resulted in a small but increasing number of gorillas, representing roughly half of the worldwide population. Bwindi has four groups of gorillas, and visitors can track them with guides in groups of no more than eight. Bwindi Impenetrable National Park has other animals than gorillas, which include colobus, vervet, and L'Hoest monkeys, elephants, jackals, civets, giant forest hog and antelope. The park is open throughout the year, but conditions during the rainy season make trekking difficult. There is tourist accommodation within the park, including a lodge and campsites.